China has not provided samples of the dangerous virus, H7N9. No samples, no vaccine! Two new clinical trials testing an experimental vaccine to prevent influenza caused by an H7N9 influenza virus are now enrolling volunteers at sites across the United States. The Influenza Risk Assessment Tool (IRAT) is an evaluation tool conceived by CDC and further developed with assistance from global animal and human health influenza experts. The IRAT is used to assess the potential pandemic risk posed by influenza A viruses that are not currently circulating in people. Input is provided by U.S. government animal and human health influenza experts. Information about the IRAT is available at Influenza Risk Assessment Tool (IRAT) Questions and Answers(https://www.cdc.gov/flu/pandemic-resources/national-strategy/risk-assessment.htm). Below is a table of results for influenza A viruses that have been assessed using IRAT because they serve as a representative of a particular subtype or are of unique interest. Avian influenza A viruses are designated as highly pathogenic avian influenza (HPAI) or low pathogenic avian influenza (LPAI) based on molecular characteristics of the virus and the ability of the virus to cause disease and death in chickens in a laboratory setting. North American avian H1N1 [A/duck/New York/1996] is a LPAI virus and in the context of the IRAT serves as an example of a low risk virus. Summary: The summary average risk score for the virus to achieve sustained human-to-human transmission was in the low risk category (less than 3). Similarly the average risk score for the virus to significantly impact public health if it were to achieve sustained human-to-human transmission also falls into the low risk range (less than 3). Swine-origin flu viruses do not normally infect humans. However, sporadic human infections with swine-origin influenza viruses have occurred. When this happens, these viruses are called “variant viruses.” Influenza A H3N2 variant viruses (also known as “H3N2v” viruses) with the matrix (M) gene from the 2009 H1N1 pandemic virus were first detected in people in July 2011. The viruses were first identified in U.S. pigs in 2010. In 2011, 12 cases of H3N2v infection were detected in the United States. In 2012, 309 cases of H3N2v infection across 12 states were detected. The latest risk assessment for this virus was conducted in December 2012 and incorporated data regarding population immunity that was lacking a year earlier. Summary: The summary average risk score for the virus to achieve sustained human-to-human transmission was in the moderate risk category (less than 6). The summary average risk score for the virus to significantly impact public health if it were to achieve sustained human-to-human transmission was in the low-moderate risk category (less than 5). The H3N2 canine influenza virus is an avian flu virus that adapted to infect dogs. This virus is different from human seasonal H3N2 viruses. Canine influenza A H3N2 virus was first detected in dogs in South Korea in 2007 and has since been reported in China and Thailand. It was first detected in dogs in the United States in April 2015(https://www.cdc.gov/flu/news/canine-influenza-update.htm). H3N2 canine influenza has reportedly infected some cats as well as dogs. There have been no reports of human cases. Summary: The average summary risk score for the virus to achieve sustained human-to-human transmission was low risk (less than 4). The average summary risk score for the virus to significantly impact public health if it were to achieve sustained human-to-human transmission was in the low risk range (less than 4). The first human cases of highly pathogenic avian influenza (HPAI) H5N1 virus were reported from Hong Kong in 1997. Since 2003, highly pathogenic H5N1 avian influenza viruses have caused over 850 laboratory-confirmed human cases; mortality among these cases was high. A risk assessment of this H5N1 clade 1 virus was conducted in 2011 soon after the IRAT was first developed and when 12 hemagglutinin (HA) clades were officially recognized. Summary: The summary average risk score for the virus to achieve sustained human-to-human transmission was in the moderate risk category (less than 6). The summary average risk score for the virus to significantly impact public health if it were to achieve sustained human-to-human transmission was in the high-moderate risk category (less than 7). In December 2014, an H5N1 highly pathogenic avian influenza virus was first isolated from an American green-winged teal in the state of Washington. This virus is a recombinant virus containing four genes of Eurasian lineage (PB2, HA, NP and M) and four genes of North American lineage (PB1, PA, NA and NS).In February 2015, the Canadian government reported isolating this virus from a backyard flock in the Fraser Valley. When this risk assessment was conducted in 2015, these were the only reported isolations of this virus. There have been no reports of human cases. Summary: The summary average risk score for the virus to achieve sustained human-to-human transmission was in the low risk category (less than 4). The summary average risk score for the virus to significantly impact public health if it were to achieve sustained human-to-human transmission was in the low-moderate risk category (less than 5). In December 2014, an H5N2 highly pathogenic avian influenza virus was first reported by the Canadian government from commercial poultry in the Fraser Valley.Subsequently this virus was isolated from wild birds, captive wild birds, backyard flocks and commercial flocks in the United States.This virus is a recombinant virus composed of five Eurasian lineage (PB2, PA, HA, M and NS) genes and three North American lineage (PB1, NP and NA) genes. There have been no reports of human cases. Summary: The average summary risk score for the virus to achieve sustained human-to-human transmission was low risk (less than 4).The average summary risk score for the virus to significantly impact public health if it were to achieve sustained human-to-human transmission was in the low-moderate risk range (less than 5). Between January 2014 and March 2016, there have been 10 human cases of H5N6 highly pathogenic avian influenza reported. Nine reportedly experienced severe disease and six died. Avian outbreaks of this virus were first reported from China in 2013. Subsequently avian outbreaks have been reported in at least three countries (China, Vietnam and Lao PDR) through 2015. Summary: The summary average risk score for the virus to achieve sustained human-to-human transmission was in the moderate range (less than 6).The average summary risk score for the virus to significantly impact on public health if it were to achieve sustained human-to-human transmission fell in the moderate range (less than 7). In December 2014, an H5N8 highly pathogenic avian influenza virus was first isolated from a sample collected in the United States from a captive gyrfalcon.Subsequently this virus was isolated from wild birds, captive wild birds, backyard flocks and commercial flocks in the United States.This virus (clade 2.3.4.4) is similar to Eurasian lineage H5N8 viruses that have been isolated in South Korea, China, Japan, the Netherlands, the United Kingdom and Germany in late 2014-early 2015.There have been no reports of human cases. Summary: The average risk score for the virus to achieve sustained human-to-human transmission was in the low-moderate range< (less than 5). The average summary risk score for the virus to significantly impact public health if it were to achieve sustained human-to-human transmission fell in the low-moderate range (less than 5). In 2003 the Netherlands reported highly pathogenic avian influenza (HPAI) in approximately 255 commercial flocks.Coinciding with human activities around these infected flocks, 89 human cases of H7N7 were identified.Cases primarily reported conjunctivitis, although a few also reported mild influenza-like illness.There was one death. Summary: The summary average risk score for this virus to achieve sustained human-to-human transmission was in the low-moderate risk range (less than 5). The summary average risk score for this virus to significantly impact the public’s health if it were to achieve sustained human-to-human transmission fell in the moderate risk range (less than 7). In January 2016, a highly pathogenic avian influenza (HPAI) virus of North American lineage was identified in a turkey flock in Indiana. Putative low pathogenic avian influenza (LPAI) viruses similar to A/turkey/Indiana/1573-2/2016 were subsequently isolated from 9 other turkey flocks in the area. There were no reports of human cases associated with this virus at the time of the IRAT scoring. Summary: A risk assessment of this LPAI virus was conducted in July 2017. 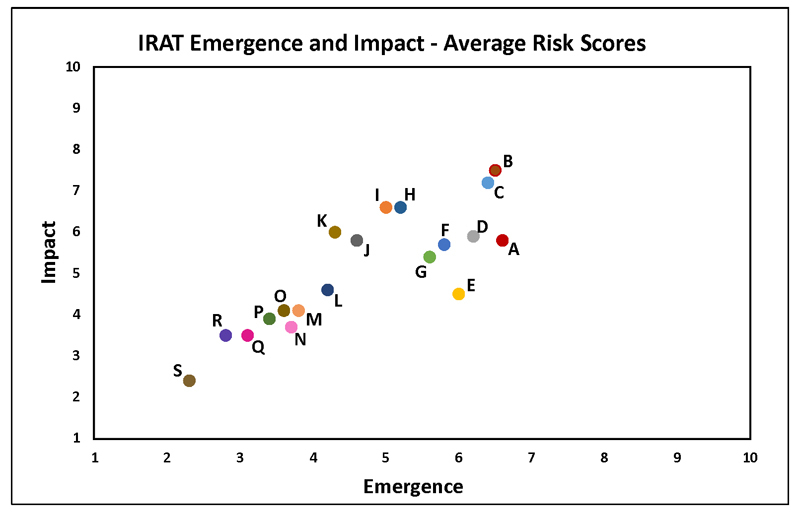 The overall IRAT risk assessment score for this virus falls into the low risk category (< 4). The summary average risk score for the virus to achieve sustained human-to-human transmission is in the low risk category (3.4). The summary average risk score for the virus to significantly impact public health if it were to achieve sustained human-to-human transmission was also in the low risk category (3.9). Low pathogenic avian influenza (LPAI) H7N9 viruses were first reported from China in March 2013. These viruses were first scored using the IRAT in March 2013 and again in April 2013, and then annually in 2014, 2015, and 2016 with no change in overall risk scores. Between October 2016 and May 2017 evidence of two divergent lineages of these viruses was detected – the Pearl River Delta lineage and the Yangtze River Delta lineage. The IRAT was used to assess LPAI H7N9 [A/Hong Kong/125/2017], a representative of the Yangtze River Delta viruses. Summary: A risk assessment of H7N9 [A/Hong Kong/125/2017] was conducted in May 2017. 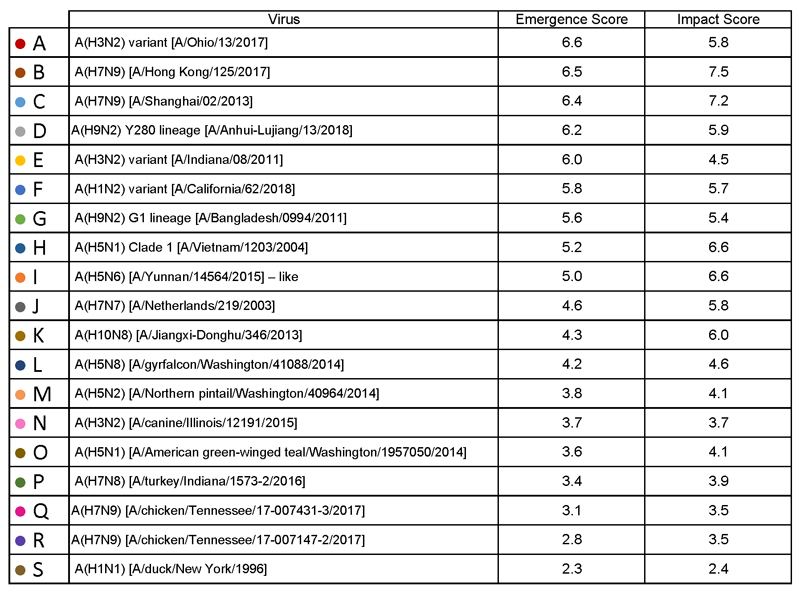 The overall IRAT risk assessment score for this virus falls into the moderate-high risk category and is similar to the scores for the previous H7N9 viruses. The summary average risk score for the virus to achieve sustained human-to-human transmission is in the moderate risk category (less than 7). The summary average risk score for the virus to significantly impact public health if it were to achieve sustained human-to-human transmission was in the moderate-high risk category (less than 8). On 31 March 2013, the China Health and Family Planning Commission notified the World Health Organization (WHO) of three cases of human infection with influenza H7N9. As of August 2016, the WHO has received reports of 821 cases, 305 have died. This low pathogenic avian influenza virus was rescored most recently in April 2016 with no substantive change in risk scores since May 2013. Summary: The summary average risk score for the virus to achieve sustained human-to-human transmission was in the moderate risk category (less than 7). The average risk score for the virus to significantly impact public health if it were to achieve sustained human-to-human transmission fell in the high-moderate risk range (less than 8). Human infections with influenza AH9N2 virus have been reported sporadically, cases reportedly exhibited mild influenza-like illness. Historically these low pathogenic avian influenza viruses have been isolated from wild and domestic birds. In response to these reports, a risk assessment of this H9N2 influenza virus was conducted in 2014. Summary: The summary average risk score for the virus to achieve sustained human-to-human transmission was in the moderate risk category (less than 6). The summary average risk score for the virus to significantly impact public health if it were to achieve sustained human-to-human transmission also fell in the moderate risk range (less than 6). Kile JC, Ren R, Liu L, et al. Update: Increase in Human Infections with Novel Asian Lineage Avian Influenza A(H7N9) Viruses During the Fifth Epidemic — China, October 1, 2016–August 7, 2017. MMWR Morb Mortal Wkly Rep 2017;66:928–932. DOI: http://dx.doi.org/10.15585/mmwr.mm6635a2. Five additional laboratory-confirmed cases of human infection with avian influenza A(H7N9) virus in China. On 19 June 2017, the National Health and Family Planning Commission of China (NHFPC) notified WHO of five additional laboratory-confirmed cases of human infection with avian influenza A(H7N9) virus in China. On 24 June 2017, the NHFPC notified WHO of 10 additional laboratory-confirmed cases of human infection with avian influenza A(H7N9) virus in China. On 30 June 2017, the NHFPC notified WHO of six additional laboratory-confirmed cases of human infection with avian influenza A(H7N9) virus in China. On 19 June 2017, the NHFPC reported five laboratory-confirmed human cases of infection with avian influenza A(H7N9) virus in China. Onset dates ranged from 25 April to 6 June 2017. Of these five cases, one was female. The median age was 55 years (range 41 to 68 years). The case patients were reported from Beijing (1), Guangxi (1), Guizhou (1), Hunan (1), and Zhejiang (1). At the time of notification, there was one death. Four cases were diagnosed as having severe pneumonia. Three cases were reported to have had exposure to poultry or live poultry market, and two had no known poultry exposure. No case clustering was reported. On 24 June 2017, the NHFPC reported 10 laboratory-confirmed human cases of infection with avian influenza A(H7N9) virus in China. Onset dates ranged from 5 to 19 June 2017. All cases were male. The median age was 53.5 years (range 31 to 79 years). The cases were reported from Anhui (1), Beijing (2), Guizhou (1), Hebei (1), Inner Mongolia (1), Jiangsu (1), Sichuan (2), and Tianjin (1). This is the first case reported in Inner Mongolia since the virus emerged in 2013 although two cases were recently reported from Shaanxi province but who had likely exposure in Inner Mongolia. At the time of notification, there were two deaths. Eight cases were diagnosed as having either pneumonia (4) or severe pneumonia (4). Nine cases were reported to have had exposure to poultry or live poultry market, and one had no known poultry exposure. A 79-year-old male, who had symptom onset on 12 June 2017 and was admitted to hospital with severe pneumonia on 15 June 2017, then died on the 21 June 2017. He was living on an upper floor of the live poultry market and passed regularly through the market. A 48-year-old male, who had symptom onset on 7 June 2017 and was admitted to hospital with severe pneumonia on 11 June 2017. He is a seller of poultry at the same live poultry market. On 30 June 2017, the NHFPC reported six laboratory-confirmed human cases of infection with avian influenza A(H7N9) virus in China. Onset dates ranged from 11 to 23 June 2017. Three cases were male. The median age was 37.5 years (range 4 to 72 years). The cases were reported from Guizhou (1), Shanxi (1), and Yunnan (4) provinces. At the time of notification no associated deaths were reported. Four cases were diagnosed as having either pneumonia (1) or severe pneumonia (3). Two mild cases, identified through ILI surveillance, were reported: one in a child with exposure to market poultry and one in an adult. Five cases were reported to have had exposure to poultry or live poultry market, and one had no known poultry exposure. These are the first cases reported with exposure to the virus in Yunnan province. Previous cases reported from Yunnan province had likely exposure in a neighbouring province. A 33-year-old female from Wenshan, Yunnan Province had symptom onset on 17 June 2017 and was admitted to hospital with severe pneumonia on the same day. She had no apparent exposure to live poultry. Her sister-in-law, a 42-year-old female also from Wenshan, Yunnan Province, visited her in the hospital, developed mild symptoms on 21 June and was hospitalized on 24 June 2017. Investigation of the case revealed that she ran a shop near a live poultry market and bought live poultry from the market on a daily basis before her symptom onset. The investigation concluded that the likely source of her infection was exposure to the virus from visiting live poultry markets. To date, a total of 1554 laboratory-confirmed human infections with avian influenza A(H7N9) virus have been reported through IHR notification since early 2013. Continuing to guide the provinces to strengthen assessment, and prevention and control measures. Continuing to strengthen control measures focusing on hygienic management of live poultry markets and cross-regional transportation. Conducting detailed source investigations to inform effective prevention and control measures. Continuing to detect and treat human infections with avian influenza A(H7N9) early to reduce mortality. Continuing to carry out risk communication and issue information notices to provide the public with guidance on self-protection. Strengthening virology surveillance to better understand levels of virus contamination in the environment as well as mutations, in order to provide further guidance for prevention and control. The number of human infections with avian influenza A(H7N9) virus and the geographical distribution in the fifth epidemic wave (i.e. onset since 1 October 2016) is greater than earlier waves. This suggests that the virus is spreading, and emphasizes that further intensive surveillance and control measures in both human and animal health sector are crucial. According to the epidemiological curve, the number of reported cases on a weekly basis seems to have peaked in early February and is slowly decreasing. The peak in cases this year corresponds to the timing of the peak in cases in previous years. Most human cases are exposed to avian influenza A(H7N9) virus through contact with infected poultry or contaminated environments, including live poultry markets. Since the virus continues to be detected in animals and environments, and live poultry vending continues, further human cases can be expected. Additional sporadic human cases of avian influenza A(H7N9) in other provinces in China that have not yet reported human cases are also expected. Similarly, sporadic human cases of avian influenza A(H7N9) detected in countries bordering China would not be unexpected. Although small clusters of cases of human infection with avian influenza A(H7N9) virus have been reported including those involving patients in the same ward, current epidemiological and virological evidence suggests that this virus has not acquired the ability of sustained transmission among humans. Therefore the likelihood of further community level spread is considered low. Close analysis of the epidemiological situation and further characterization of the most recent viruses are critical to assess associated risk and to adjust risk management measures in a timely manner. WHO advises that travellers to countries with known outbreaks of avian influenza should avoid, if possible, poultry farms, contact with animals in live poultry markets, entering areas where poultry may be slaughtered, or contact with any surfaces that appear to be contaminated with faeces from poultry or other animals. Travellers should also wash their hands often with soap and water, and follow good food safety and good food hygiene practices. WHO does not advise special screening at points of entry with regard to this event, nor does it currently recommend any travel or trade restrictions. As always, a diagnosis of infection with an avian influenza virus should be considered in individuals who develop severe acute respiratory symptoms while travelling in or soon after returning from an area where avian influenza is a concern. WHO encourages countries to continue strengthening influenza surveillance, including surveillance for severe acute respiratory infections (SARI) and influenza-like illness (ILI) and to carefully review any unusual patterns, ensure reporting of human infections under the IHR 2005, and continue national health preparedness actions. 12 H7N9 avian flu cases reported from China’s mainland from Jun 2 through Jun 8. The Centre for Health Protection (CHP) of the Department of Health today (June 9) is monitoring a notification from the National Health and Family Planning Commission that 12 additional human cases of avian influenza A(H7N9) were recorded from June 2 to 8, and strongly urged the public to maintain strict personal, food and environmental hygiene both locally and during travel. The eight male and four female patients, aged from 4 to 68, had onset from May 20 to June 3. Three of them are from Beijing, two each from Anhui, Chongqing and Henan, and one each from Jiangsu, Shaanxi and Shandong. Two cases reported in Beijing were likely infected in Hebei and Shanxi while the case reported in Shaanxi was likely infected in Inner Mongolia Autonomous Region. Among them, nine were known to have exposure to poultry, poultry markets or mobile stalls. The CHP’s Port Health Office conducts health surveillance measures at all boundary control points. Thermal imaging systems are in place for body temperature checks on inbound travellers. Suspected cases will be immediately referred to public hospitals for follow-up. The public may visit the CHP’s pages for more information: the avian influenza page, the weekly Avian Influenza Report, global statistics and affected areas of avian influenza, the Facebook Page and the YouTube Channel.